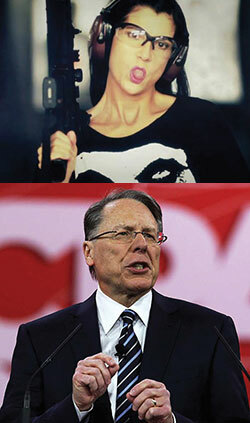 Again, Who’s Afraid of the NRA? The NRA faces a combination of circumstances that aggregate into a real threat, if not to the organization’s long-term existence which seems assured, than certainly the organization’s once (pardon us) bulletproof sway among virtually all Republican lawmakers and no small number of Democrats. President Barack Obama’s victory in 2008 provoked a massive buying spree of firearms by (needlessly) panicked gun owners, and gun manufacturers obligingly plowed those profits right back into the NRA’s advocacy budget. But with Trump as President, the hype that motivated the frenzied buying of guns under Obama just doesn’t exist. At the same time, the continuing and worsening toll of mass shooting events in the United States has forced the debate over guns outside the NRA’s strictly-enforced boundaries. Here in Colorado, public reaction to gun safety laws that led to recall campaigns against Democrats in 2013 would look very different now, after so many intervening mass shootings with body counts that dwarf the 2012 Aurora theater massacre. Still another factor negatively impacting the NRA’s political strength is a perception among hardened gun-rights advocates that the NRA has gotten “soft” on the issue–a view eagerly promoted by Colorado’s own Dudley Brown, who wields great influence within the gun enthusiast community through his local and national front groups. The NRA’s recent broadening into multi-issue conservative advocacy was meant to counter this ebb in support, but it also has had the effect of driving politically neutral or even left of center supporters away. For all of these reasons, it’s not a surprise to us that the NRA’s political relevance is on the wane. If the present trend of radicalization among gun owners continues, along with a growing movement in the United States for gun safety laws considerably tighter than the status quo today, it’s a trend that could continue. For intelligent gun-rights supporters, giving the Dudley Browns of the world more power to disrupt Republican election strategy like they did in 2018 is a disastrous prospect–but that is the trajectory today. The NRA badly needs another Democratic president so gun sales will take off. It still owes Obama a huge commission. I'm waiting to hear what Mueller finds about how much money the Russians funneled through the NRA to help Trump in the 2016 campaign. If DB ever gives it up – we'll find out how much more. I am a gun owner. I also consider endorsement by the NRA to be almost a political kiss of death. They are far too extreme and I have almost always voted against their candidates and for candidates that want to regulate guns. So it is natural that I am going to quibble about "the present trend of radicalization among gun owners". The core of the NRA are gun nuts who fervently believe that the only thing stopping a coke crazed commie black panther from taking their TV is a gun. However gun owners is a broad group. According to a 2017 Pew survey about half of current gun owners support creating a Federal database of gun sales and banning assault-style weapons. In the same survey they found a that third of gun owners do not favor allowing concealed carry in more places or arming teachers. Even the NRA pegs its membership as being less than 5 million people. If Pew is right about 30% of adults being gun owners that means there are about 75 million gun owners. So something short of 7% of gun owners are in the NRA, and that is short of being 2% of the whole US adult population. Based on a 2018 US adult population of about 253,000,000. From surveys and meeting other gun owners, I would say that around half are radical or becoming more radical. The other half are the milder types who own guns but do not make “gun owner” part of their identity. Why don't the kinder, gentler gun owners organize? The NRA needs some competition. It has groups like RMGO running to its right. The sane and responsible gun owners should open their mouths about gun ownership and gun safety as not being mutually exclusive. There is Gun Owners for Responsible Gun Ownership, and a bunch of other groups for non-nuts who are gun owners. They do not get attention because of the "only two sides" nature of press coverage and because moderate groups are always are a bit less popular than ones that can whip of fear/anger to grab support. Plus those sweet corporate dollars. Personally I would just join "Everytown for Gun Safety" if this were my main political issue since they get more press coverage. They are moderate enough for me and they get more attention than responsible gun owner groups. And while I am an owner I am not the type who does more than shoot some targets once a year. The rest of the time my guns are locked up in a vault with another gun owner's small collection. Brady's Campaign to Prevent Gun Violence and Gabby Gifford's groups (giffords.org) are other sane organizations on gun safety. I think the biggest factor in the decline of the NRA and other gun groups is they are fighting for shares of a declining percentage of the population. A lower proportion of people own guns — possibly even a declining total number of gun owners. The ones who do own guns have more of them, but there are a declining number of one-time military draftees and people who live in the country and "of course" have guns as tools for their property. If the agricultural sector continues to lose net income, there will be even fewer gun owners. The NRA and RMGO were totally ineffective in the 2018 elections in Colorado. RMGO supported 6 candidates in various primaries. Only one was successful. In the General Election, the NRA spent $232,000 in Colorado statewide and legislative races. NONE of their supported candidates won. In the General Election, RMGO spent $75,000 in Colorado statewide and legislative races. Also, they came up with a whopping ZERO. Let us not credit RMGO for Representative Cole Wist's loss. Tom Sullivan ran a dynamite campaign, knocking on more doors than any other legislative candidate in the US, save one. Additionally, Arapahoe County voters showed they were fed up with the Republicans and elected Jason Crow to Congress by a comfortable margin (11 points). Sullivan's district is contained in CD6. Also, Republican Representative Susan Beckman in the adjacent district won by nearly 16 points in 2016, but barely scraped by with 0.5% margin in 2018. Sullivan ran a great campaign but that is normally a Republican district. I'd like to give the RMGO a little credit for helping Sullivan push out Cole the Mole. I also would like to thank the RMGO for helping Phil Weiser get elected A.G.
That district is trending Dem. Hillary Clinton carried it in 2016. HRC carried CD6, but so did Coffman? What do you figure HRC voters who loved Coffman too much to let him go? Or, maybe they were just sympathetic since he need another term to add to his Congressional pension?